Years ago, while living in Chicago, I had the good fortune to teach with Vivian Paley at the University of Chicago Laboratory School. Vivian is a giant in the world of early childhood education, known as a master teacher and author (check our library shelves in the living room). While her close observations and theories about young children’s development are still read and studied, maybe her most important legacy is Story Telling and Acting. (ST/SA for short) I have planted the seed for this activity in every school where I have taught, and All Seasons parents know it well. Briefly, each child has a story journal in which the teacher writes a story told, and usually illustrated, by the child. At group time these stories are acted out by the whole class. We act the stories out in the order in which they are dictated, since they tend to build on each other as children listen to and are inspired by each other. Part of the magic of this activity is the way life in the classroom and at home is reflected in the stories. Currently, a small dog named Tiny is featured in many of the children’s stories. Tiny is a dog owned by one of the Inver Glen residents and well known to the children, though, by now, he has been transformed well beyond the original. Story telling and acting have multiple literacy opportunities and benefits, as well as being powerful in creating and nurturing community. Ask Amy or me for more information if you’re interested. You may have been following the Fairy Saga, involving both preschool classrooms. Mysterious evidence of fairy life in the woods began to appear several weeks ago, much to the delight of everyone. The teachers took photos and recorded the childrens’ ideas about the who/what/when/why of it all. A display board took shape and the teachers brought writing and drawing tools outside, thinking the children would like to draw the fairy encampment. But instead, they chose to write stories about them. I loved that turn of events and it brought me back to every time I have introduced ST/SA to children. They understand the idea with little explanation, and the story table is crowded with eager tellers. The acting requires a few simple directions, and they’re off. 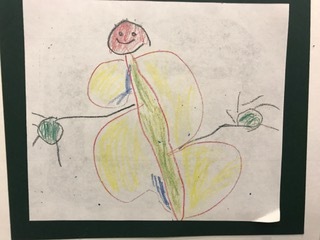 I sent a description and photos of this latest development of ST/SA to Vivian, knowing the delight she takes in news of the All Seasons children. Long retired, she misses the classroom, and corresponds with many teachers all over the world who use her books and ideas. She is especially cheered by our use of ST/SA in light of the changes to the preschool curriculum over the past years that make it mostly unrecognizable to us old-timers. Now she is dreaming of writing a book for young children “as good as Runaway Bunny [by Margaret Wise Brown].” I will keep you posted! 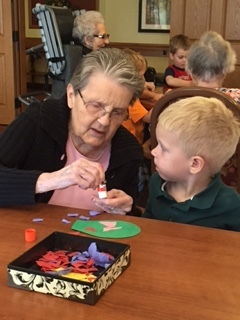 One morning in October we headed up to Willow Cove West, one of two memory care units the preschoolers visit each morning. 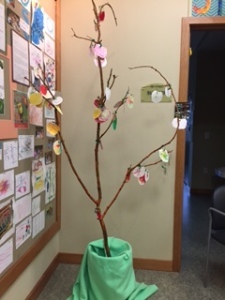 Our task that day was simple; to decorate apples for our school’s new “apple tree” – a large tree limb with several smaller branches. After painting our “tree” with glittery paints, children were motivated to decorate apples to hang on the naked tree. Off we headed to first floor, arriving in high spirits. Children buzzed around the tables, hugging and shaking hands with the familiar grandmas and grandpas. Once everyone had a place next to a senior, we were ready to begin! Each child and senior was given a plain apple cut out from white construction paper. Set out were trays of apple-colored crayons. Since the apples would hang with both sides visible, everyone was instructed to color their apples completely on both sides. Also demonstrated by a teacher was a small scribble in the middle of the paper apple, a visual reminder of what not to do. Children and seniors eagerly got to work. As always, we were reminded that what is challenging for our youngsters can be equally challenging for our elders. Within sixty seconds, many (children and seniors alike) called out, “I’m done!” holding up their small, brightly colored dot in the middle of the apple. The inability to sustain focus and to delay gratification were demonstrated with a handful of our apple-makers, while others determinedly colored away until the apple was completely covered. • One grandma, who was eating breakfast when we arrived, began coloring the kitchen table with her hard-boiled egg, smiling at the children working around her. 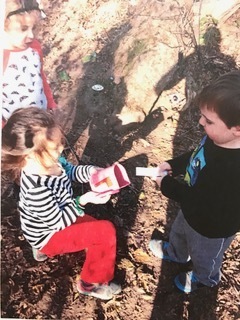 This continued until an aid gently removed the egg and replaced it with a sparkly red crayon, placing an apple under her hand. • Another grandma could not get her marker to work. “This isn’t working well.” The little girl next to her said, “I’ll help her,” gently removing the cap off the marker. Next this grandma proceeded to color her apple, but with the back end of the marker. Laughing, she said, “It STILL doesn’t work!” The little girl turned the marker so it was facing the right direction and the grandma smiled with satisfaction as her apple went from a pale white to a bright red. The other end of the age spectrum revealed similar challenges; a little boy repeatedly yelled, “I need help! I need help!” When asked what he needed, he pointed to a crayon one of the grandpas was using. “I wanted THAT one.” Though there were other crayons of the very same color available, he insisted on waiting for that particular crayon already in use. Suspended at the starting gates, he repeated “I need help!” until he had that desired crayon and magically all was right with his world. Activities like these highlight a theory called “retrogenesis,” which states that once people reach a certain stage of dementia, their brains deteriorate cognitively in the reverse order of how their brains developed from birth. For us, it is the main reason intergenerational pairing works so beautifully; every day our children have the opportunity to interact with seniors who are functioning cognitively at levels similar to theirs. But most importantly, both groups are able to give each other what they both need more than anything; time and attention.